The street dog that is at our house most of the time, seems to prefer The Moody Blues. He sleeps through the Beatles. This entry was posted in Uncategorized on May 14, 2017 by gubabbaboy. OK, yes, it’s loud. We use our big speakers, and I’ve heard that it can be noticed in a town less than a mile away. Right now we’re hearing The Eagles. People are on their way to mass. They just can’t miss it. Time for breakfast of tamales at 5 pesos apiece. With beans, and café de la olla – check it out! Delicious! This entry was posted in ex-pats in Mexico, gringos in Mexico, performing musicians, rancho life in Mexico, retirement in Mexico, small town life in Mexico on May 14, 2017 by gubabbaboy. You say you can’t imagine being interested in hearing a lot of hearty men’s voices singing in two-part harmony with acoustic instruments, or seeing middle-aged dancers in almost medieval costumes, moving gracefully to that same sound? A little bit Spanish, a little bit European, a little bit Middle Eastern? We used to watch a very pleasant program on Saturday mornings, and then it got moved to a (much!) earlier time before it disappeared completely. Now it’s back in Mexico on Saturday mornings again, so we have a reason not to lounge around in bed when we’re not tending the crops. Tenderete, a forty-year-old program from Spain, offers a varied palate of music to appreciate. 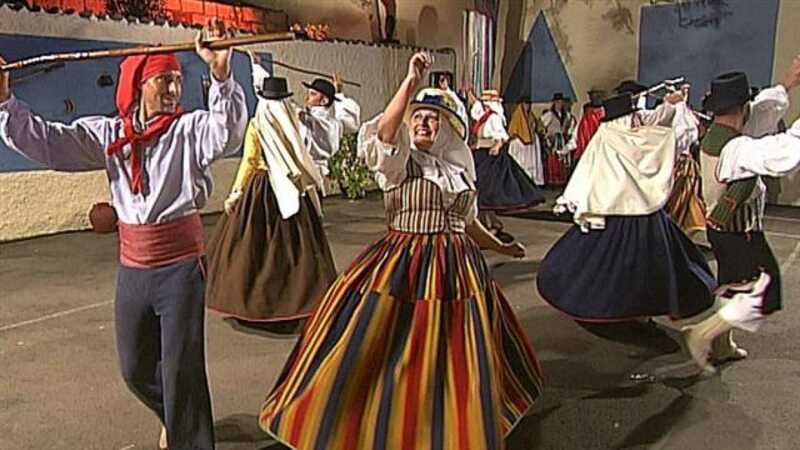 From the Canary Islands, featuring local groups of singers and dancers, performing traditional music not just from Spain, but from many Latin American countries, it’s produced by Spanish public television. Imagine your local university choir or chorale. Now put the group in traditional costume from Old Spain, which is very likely different from what you might imagine. The harmonies may be simpler than you’re imagining – two-or-three-part instead of up to eight parts. But the singing is mostly excellent. The men’s voices especially, are good – manly and easy. There’s instrumental accompaniment. Mandolins. Guitars. Charangos. Timples. Percussion. Dancing. What’s not to like? 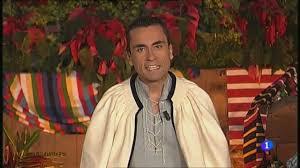 The pleasant and knowledgeable host of Tenderete, David Peñate. You’ll hear song forms, and they’re OLD ones – perhaps hundreds of years old. 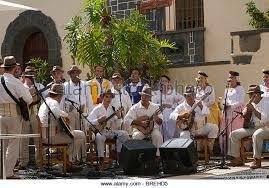 There is musica tipica (folk-type) and popular music from other countries, including Mexico, Cuba, Peru. Try it. You might find that you like it, as I do. But you have to persevere! You may think at first “Oh, this is boring.” If you want to win the prize you must listen. Pay attention to the instrumental playing. Really look at the dancing and costumes! Listen, really listen to the voices! There are new and cached performances on Facebook: https://www.facebook.com/Tenderete-TVE-en-Canarias-154748447901578/, and maybe you can find it on your local public access, as well. When we continue our Saturday morning on the same station we get news and travel from Spain. This entry was posted in ex-pats in Mexico, gringos in Mexico, performing musicians, Uncategorized and tagged music of the Canary Islands, public television, Tenderete on May 3, 2017 by gubabbaboy.